Yesterday I made significant strides to becoming more Yoruba. 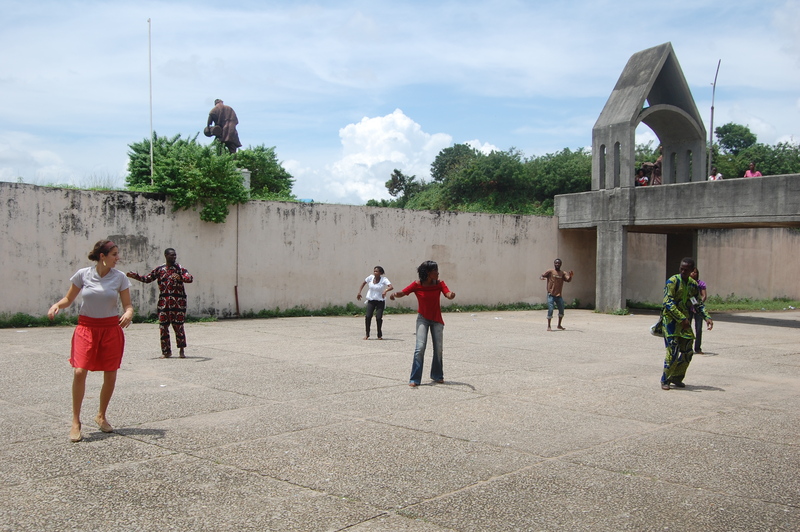 Keegan and I went to the Cultural Center of Ibadan where we are supposed to be a month into our internship. When we arrived yesterday afternoon, the directors of the government-run center had no work for us not to mention a plan of what we are going to do for the next month and a half. We spent 30 minutes deciding that we will split our work into working with the performing arts department for 2 weeks and the visual arts department for 2 weeks. That was our ‘work’ for the day. Outside of the center we stumbled upon a dance troupe practicing for a competition later that day. 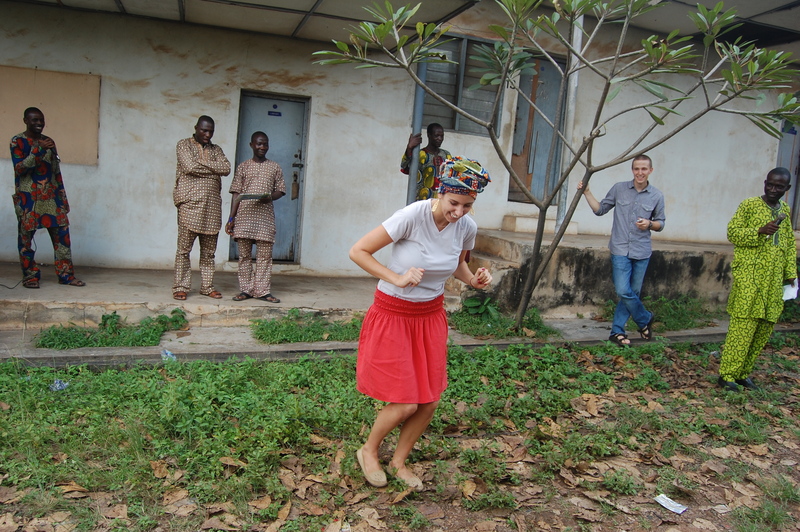 Keegan, my teacher Segun, and I stood around, pretending to play a ‘bata’, watching until Sango (pronounced Shango) commanded me to join the team’s practice. I seized the moment and tried, somewhat unsuccessfully to follow the sharp, fast gyrating movements. I'm on the far left struggling to follow the fast dance moves. The girls and 2 men in the team didn’t seem to mind my presence and befriended Keegan and I after. 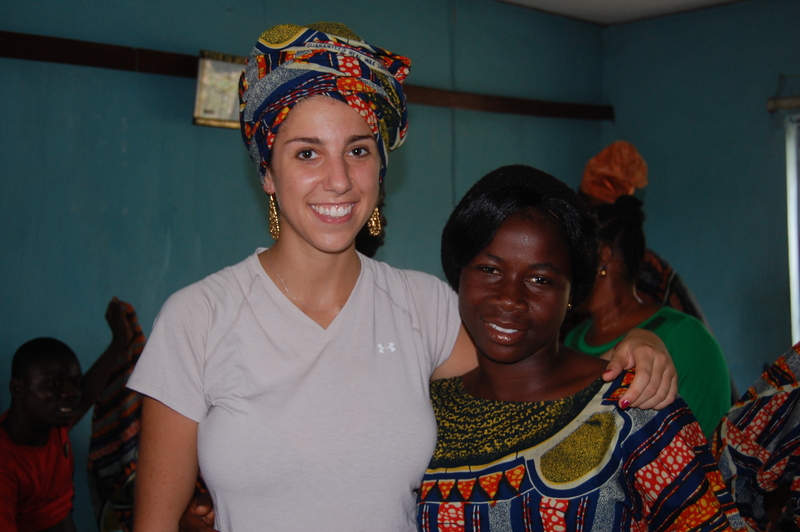 I became fast friends with a 20-year-old girl named Precious. I recited a few proverbs, told her my Yoruba names (which she did not believe) and after 2 minutes she was stuck to my side, her arm interlocked with mine the rest of the day. Precious and I. 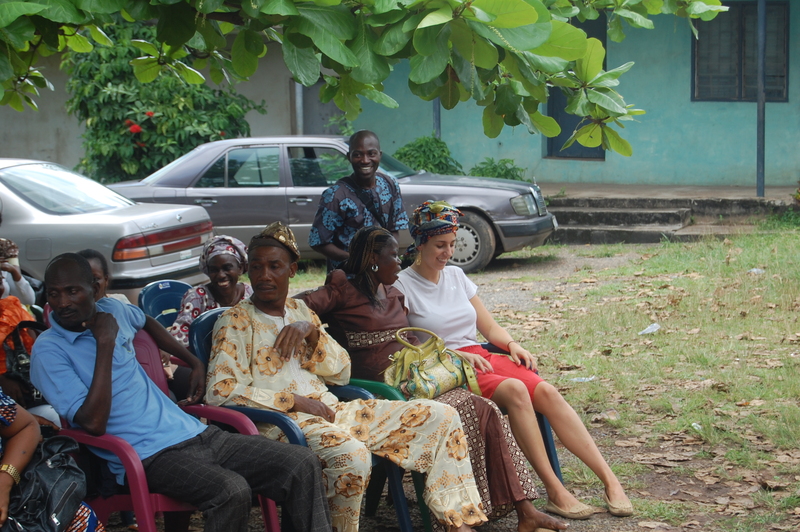 The girls helped me 'we gele' to blend in with the Yoruba culture. It is common for girls and boys to hold hands here. Strangers are always touching me or holding my hand for a bit longer than is culturally accepted in the U.S.
After the dance rehearsal we went to the competition with the team. We sat and talked with them while they got dressed in traditional Yoruba clothes to perform, speaking Yoruba the entire time. This was so exhilarating for me because it was the first chance I had to speak Yoruba comfortably with new people my age outside of University of Ibadan walls. We sat down outside under the shade of a tree to watch the performance. Sitting under a tree to keep out of the sun at the dance competition. I decided to let my inhibitions go and dance for the audience at the dance competition. All of the introductions, prayers and greetings took much too long and we had to leave before the dancers performed. Dance is a big part of Yoruba culture and knowing how to dance well, in addition to knowing the language and proverbs, is really impressive to Yoruba people. Shango is coming to our center to give us dance lessons and we will also learn at our internship at the Cultural Center. For now I might be making a fool of myself, but they will respect me soon enough. Enter your email address to subscribe to North of Lagos and receive notifications of new posts by email. Like Titi Oyinbo on Facebook!